Iphone X PCB Positioning Fixture with double the motherboard tin protection.Also with A11CPU, WIFI, baseband module cooling anti-explosion tin Weld protection. 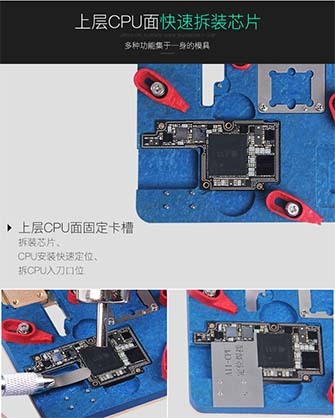 A11CPU, WIFI, baseband module cooling anti-explosion tin Weld protection. Iphone X Multi-functional Platform A11CPU, hard drive in addition to plastic positioning.